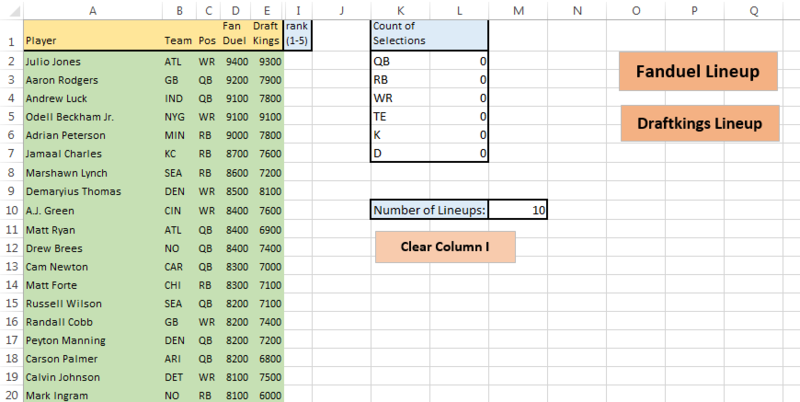 Excel Spreadsheet Tool to help you win at DFS! With all software there is a learning curve. 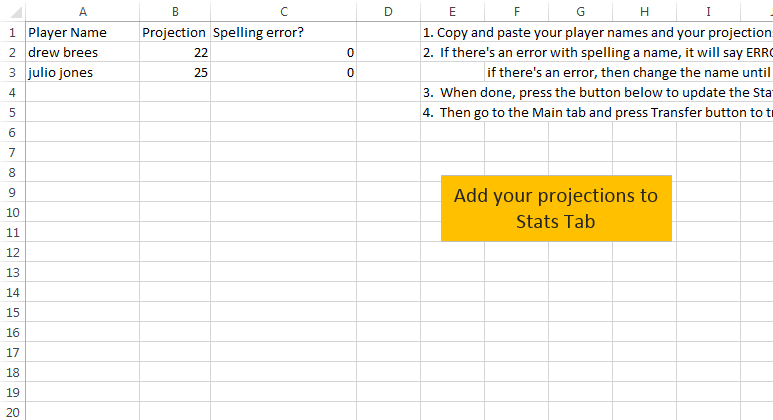 I will explain below how to use my spreadsheet tool for NFL Football. Step 1 – Main Tab – When you use the spreadsheet for the first time, enter your login info in and press Refresh Logins. After doing that the first time, you won’t have to anymore. Just keep the login info in there. After you login, you need to press Refresh This week’s Data. It will update all the games and stats. It will run for about 1 to 2 minutes. When its done, it will take you to the Stats Page. Next, go back to the Main tab and fill in column F. Enter yes for all the teams you want to run lineups for. Then click Transfer Players to move the players to the 3 lineup optimizer tabs. Step 2 – Stats Page – This page tells all the important stats you need to research players for the week. Everything from salaries, projections, 2015 and 2014 full stats, defensive rankings verse position, and more. Team to stack – enter which team to stack and how many to use. Weigh the lineup – It defaults to Normal . That means it chooses players based only on projections and salary. Change it to high risk and it will favor those boom or bust type players. Change it to Cash game and it will favor those players with less risk and give them a higher projection. Column S lets you include or Exclude players. Make sure to not Include too many high priced guys or solver wont find a lineup. Step 4 Multilineup 2 – This uses Solver but doesn’t go by projections. All you do is go through the players you want included in your lineups and enter a 1 through 5 in column I. If you leave it blank, they will never get picked. The higher the number, the more lineups this player will be in. Make sure you have at least 1 player in each position. Preferable to have more for RB, WR and QB. Make sure to have enough low priced options to enable lineups to be made. Run up to 200 lineups. Step 5 Multilineup 3 – On this tab you can run up to 1000 lineups in 2 to 3 minutes. This does not run by Solver, but by my own programming. On this tab you can run for Fanduel, Draftkings or Yahoo. You can also stack teams and choose if you want a QB to WR/TE combo. You can also Include or exclude players and pick projections like the other tabs. Step 6 Your Lineups – All your lineups from Multilineup 1 or 2 end up going here. From here you can press “Injury Status of your Lineups” and it will take you to a page that shows the injury status of all the players in all of these lineups. You can also press “Export to csv” and it will create a csv file which you can upload to Draftkings or Fanduel to bulk lineups. Step 7 Your Projections – Here you can add in your own projections into the stats page easily. Just copy the names with projections into column A and B. If a name doesn’t match our stats page, you will get an error message in column C. Then press the button to add them. That’s an overview of my NFL spreadsheet. I hope this helps you to use it better!